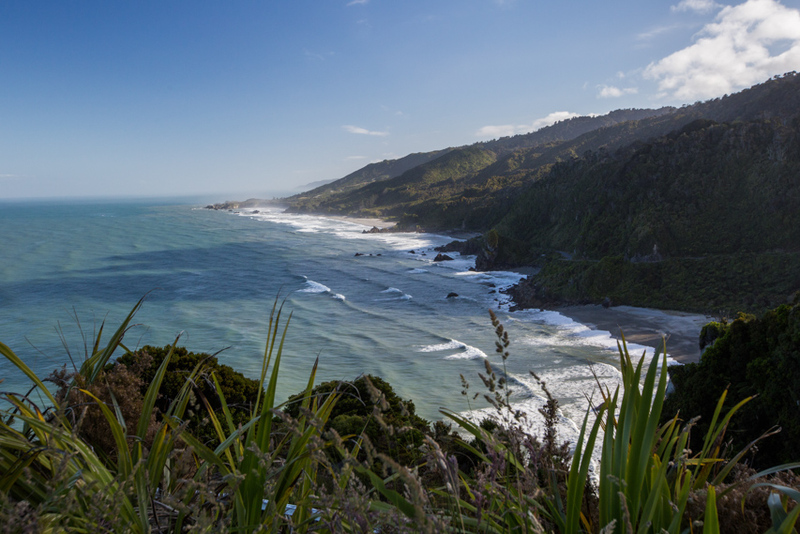 Our roadtrip around the South Island over the holidays last year kicked off with us spending Christmas day exploring the wild west coast of New Zealand. Living on the other side of the world from our families, the last three Christmas’ we have been on the road without your typical holiday traditions. We’ve usually been driving for several hours, spending Christmas eve in the comfort of our little tent at a campsite in a small town in New Zealand. And this year was no exception! We ended up crashing at this cute little campsite owned by a french couple called Jack’s Gasthof. It was just outside Charleston and for $8 a person you got a beautiful landscaped, private campsite with access to toilets and hot showers. There’s even a little cafe on site that is supposed to have great pizza and if you purchase something, you have access to free wifi! One of the best deals we’ve found in New Zealand for a campsite! The next morning we set off for the coast and drove down the incredible twisty road that hugged the coastline, providing some spectacular views. Given it was Christmas morning there was no one around, but that also means there was nothing open so we spent the day exploring some of the best free activities along the west coast. First stop was to the Punekaki Pancake Rocks and Blowholes. 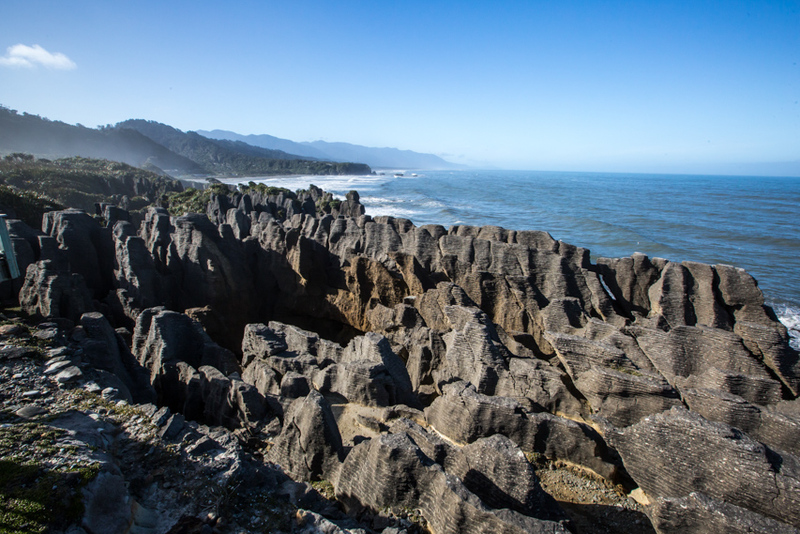 Located in the Paparoa National Park, these limestone formations were formed over 30 million years ago when tiny fragments of dead marine animals and plant life landed on the ocean floor 2km below the surface. The pressure of the water caused them to solidify into layers of limestone, mixed with soft layers of mud. Seismic activity gradually lifted the limestone above the seabed where the softer layers of mud were eroded away by the tides, leaving a “pancake” like stack of hard limestone. A short loop track off the main road, we walked to the pancake rocks and were mesmerized by these unique formations as the sound of waves crashing in the surge pool echoed throughout the area. 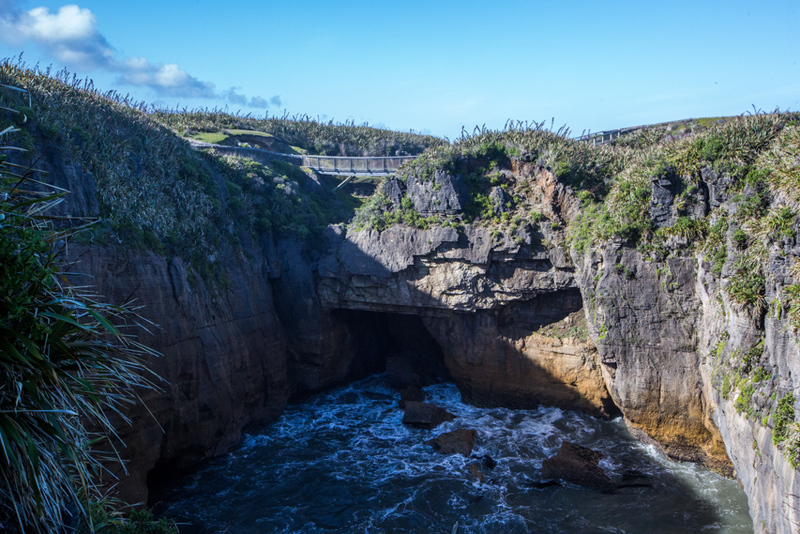 The best time to visit is during high tide on a westerly wind as that is when the blowholes really put on a show! We saw a bit of action but not to the extend of which I’ve heard these can display. The rest of the trail loops around the coast to more interesting rock formations and back through the flax fields to the carpark. 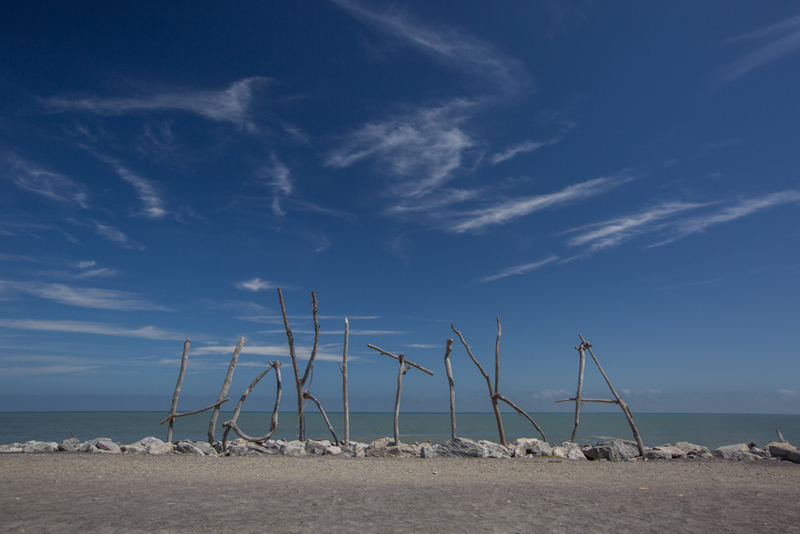 As we hopped in the car down the coast we couldn’t help but stop to see the famous Hokitika beach sign. Made from driftwood found along the beach, it was surprising how many people were there waiting to take a photo, so we snapped one quickly and moved on to our next destination. We veered inland down the quiet road towards Hokitika Gorge. I’ve always heard this place was worth the detour so we took the 30 minute drive to see for ourselves. The carpark was small and quite busy, but after a few loops we finally saw a space free up and snagged it quickly. As we walked down the path it was funny to see how many people were wearing Santa hats and wishing everyone a Merry Christmas! A few minutes down the track we got a glimpse of the stunning turquoise waters snaking through the trees. 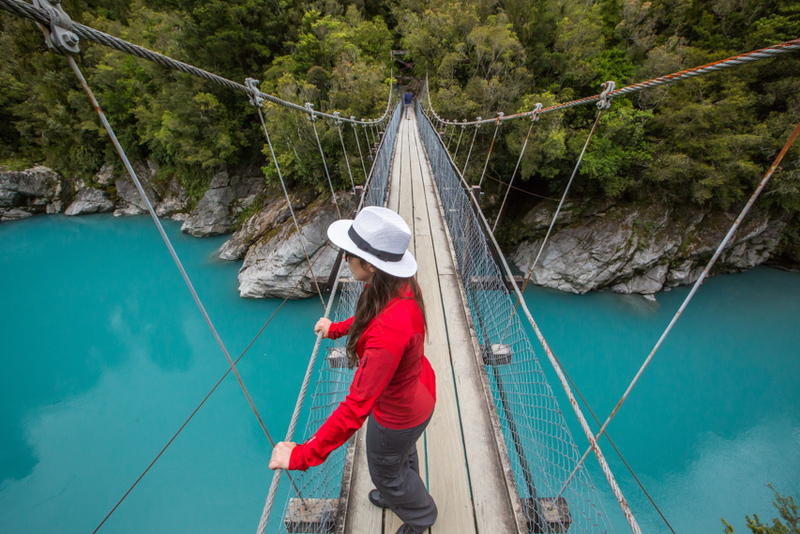 We came upon one of New Zealand’s typical swing bridges that towered over the turquoise river below. It’s still hard to believe this color is natural. It looks like it could be some kind of radio active material left over from some kind of nuclear meltdown! We wandered through the trees a bit further before reaching the end of the track that led down to water. We hoped around on the rocks as we took in the spectacular gorge and enjoyed a few minutes of taking it all in. It was fairly busy for it being Christmas Day, but with record numbers of tourist this season it was no surprise. Back at the car we headed towards to coast again this time looking for the infamous Amethest Hot Springs. One of the only locations in the South Island, we were on the hunt for this secret spot that our NZ Frenzy Book said was located along a river at the end of a dirt road. Thank goodness we had the detailed directions from the book as I don’t think there would be any way we could have found them without it! 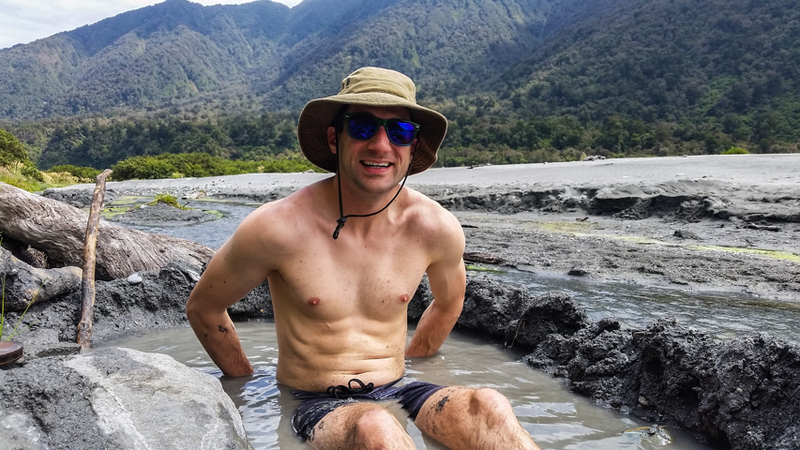 Even with the book it was still a bit of an adventure to actually find the hot water along the flowing glacier river. As we walked along the edge of the river, we took off our sandals so we could feel the temperature of the water. Eventually we found a spot that was quite warm and began digging ourselves a little hot pool. The only thing that was quite different from the Rotorua hot pools we’ve frequented was the black flies! These little bastards are notoriously bad on the West Coast of New Zealand and this spot was no exception. We literally tried to bury ourselves in the mud and water, leaving as little exposed skin as possible, but unfortunately the nuisance became too much and after about 20 minutes we decided to leave. Finally making our way towards glacier territory we landed at our campsite for the night at Rainforest Holiday Park. The next day we were heading off on a mountaineering adventure up to Centennial Hut so we just needed a place to crash for the evening. I was glad we were only staying one night as we realized the holiday park wasn’t really geared towards tents and catered more to campervans as we ended up having to put our tent on a tiny piece of grass off a gravel lot. Lesson learned! Beautiful photos of New Zealand! I would love to go next Spring! Great article! 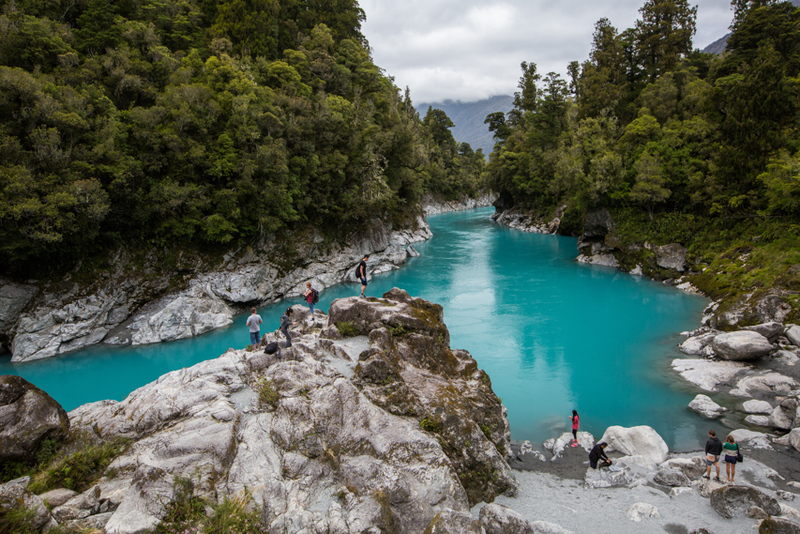 This turquoise water that held me with fascination makes me wanting to visit New Zealand. I can’t believe there are still places like this. Thanks for the glimpse. You always got us inspired. Very beautiful. Love the scenic gorge.